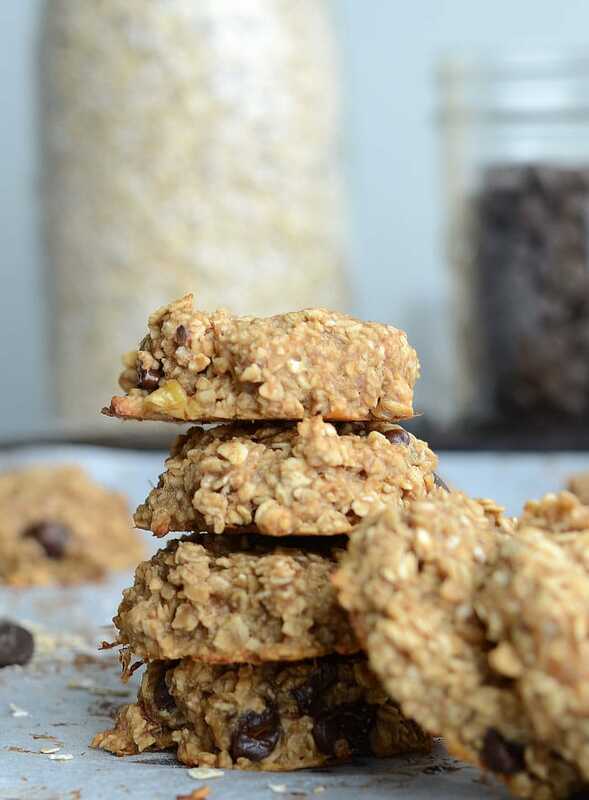 When you need a super quick and easy treat made with minimal, wholesome ingredients, give these healthy Flourless Peanut Butter Banana Oatmeal Cookies a try! 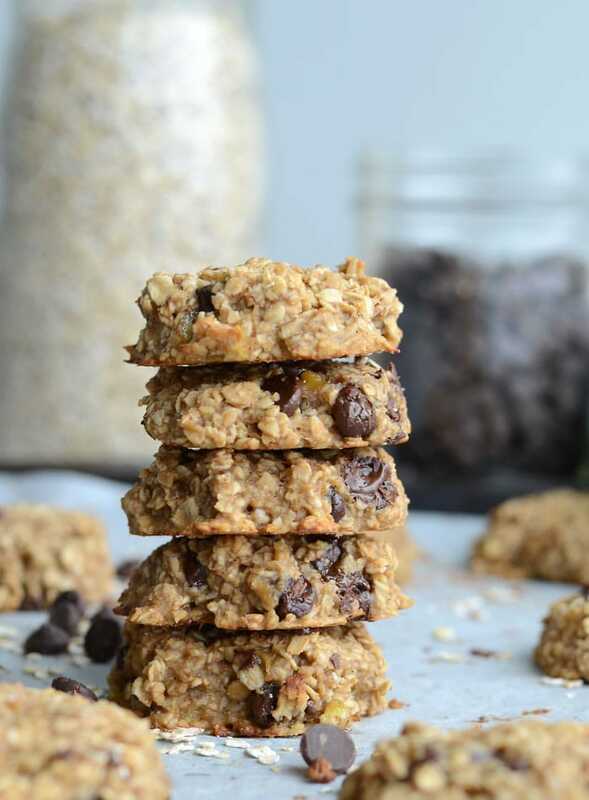 They’re soft and chewy, naturally sweetened with banana and a dash of maple syrup and they’re healthy enough to enjoy as a snack, quick breakfast on-the-go or dessert. These little treats are oil-free, egg-free, dairy-free, gluten-free, have no added sugar and are just simply delicious! If you want to get crazy….crazy delicious that is, go ahead and add in some dairy-free chocolate chips! Raisins or chopped walnuts would also be awesome, or any of the above, or ALL OF THE ABOVE! Why not, right? I also like adding a pinch of sea salt and a dash of pure vanilla extract for extra flavour. You can also add a pinch of cinnamon if you like! If you prefer to go a little healthier, you can leave out the maple syrup and chocolate chips. They’ll just be a tad less sweet but they’ll still be tasty and satisfying. You can always add a few pinches of stevia if you want them to be a bit sweeter. If you want to reduce the fat, replace the peanut butter with powdered peanut butter. You can either mix the powdered peanut butter with water first to create “peanut butter” or just add it in as is. If you just add the powder straight into the dough, you may need a little extra banana or applesauce to for extra moisture. You can’t really go wrong with these so don’t worry too much about the exact amounts. As long as it has a thick cookie dough consistency before baking you should be good to go. Please keep in mind since these have very minimal ingredients and no flour, they’re quite chewy and have more of a muffin-like texture. I love them though and they’re one of my favourite go-to treats. They make an awesome snack, especially before a workout, or after dinner…okay, anytime at all, and I guarantee they’ll satisfy a craving for something sweet! My favourite way to make them with with natural peanut butter, extra ripe bananas and the added pure maple syrup, vanilla and chocolate chips. If I’m gonna eat cookies, I wanna eat a cookie, ya know what I mean? If you’re still using processed peanut butter in your home, it’s about time you switch over to natural peanut butter. It’s a simply switch you can make on your journey to a healthier lifestyle. If you’re unfamiliar with natural peanut butter, you’ll notice that when you bring it home from the store, the oil has most likely separated. No worries, just stir it in using spoon or knife or store it upside down to let it mix up on it’s own. Natural peanut butter should have just one or maybe two ingredients: peanuts and salt. The ingredients in processed peanut butters will vary by brand by they all contain hydrogenated oils and added sugar. Because of the added hydrogenated oils, processed peanut butter has a completely different consistency than natural peanut butter. I used to love Kraft and JIF Peanut Butter when I was a kid but as an adult the consistency and flavour just seem bizarre to me. Ditch the processed peanut butter and the trans fats and refined sugar it comes with and make the switch! You can even easily make your own peanut butter if you have a high-powered blender or good food processor. 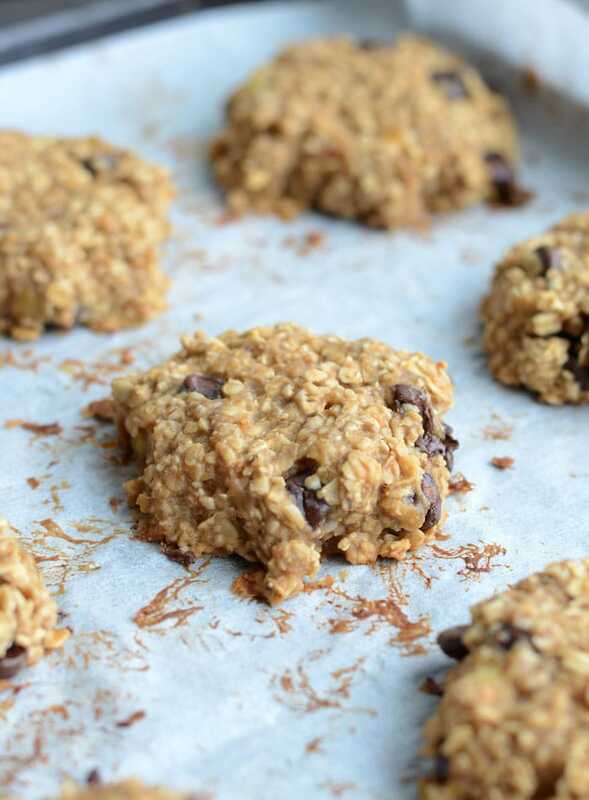 With just a few ingredients, these simple peanut butter banana oatmeal cookies are so easy to make! 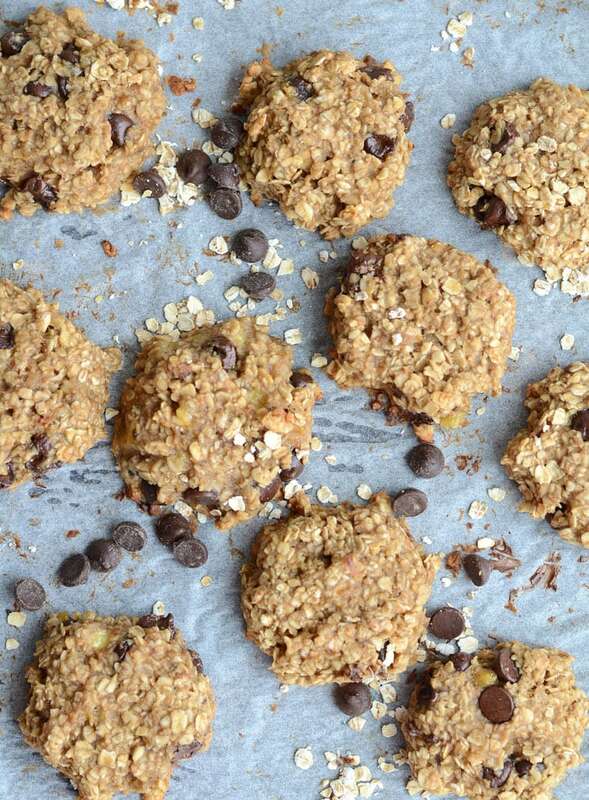 You really only need 3 ingredients to make them: oats, banana and peanut butter. The rest are just bonus ingredients! Check out the video below where I used just banana, peanut butter, oats and chocolate chips. They come out awesome just like that! I love the addition of 1 tbsp of maple syrup and a dash of pure vanilla extract and sea salt though. Either way, they taste amazing, have a super yummy texture and are a cinch to make. They’re gluten-free, vegan, oil-free, sugar-free and are just 138 calories per serving if you make them with chocolate chips. Leave those out and the calories will be reduced a bit. I only used 1/4 cup though so between 16 cookies, that didn’t add much extra fat and carbs. 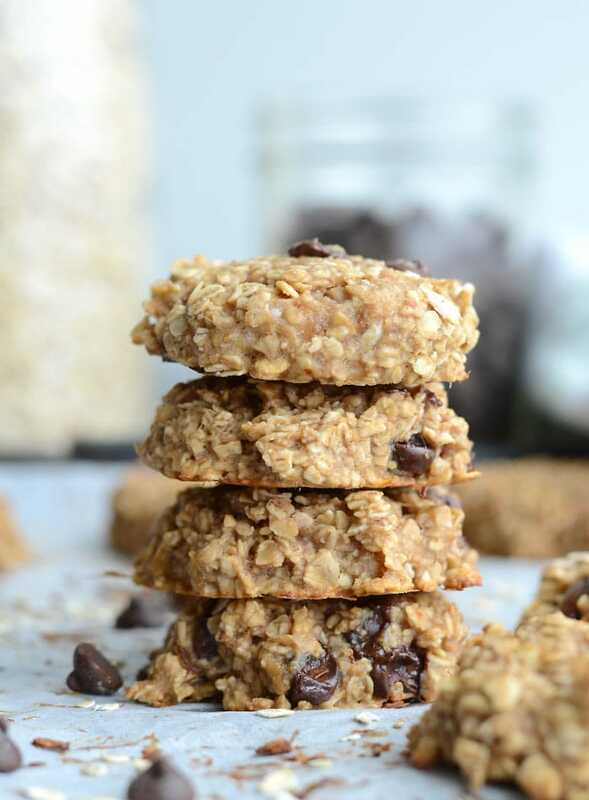 If you’re tracking macros or watching calories and follow the recipe below, including chocolate chips and maple syrup, these cookies are 138 calories each with 18 grams of carbs, 5.5 grams of fat and 3.5 grams of protein. 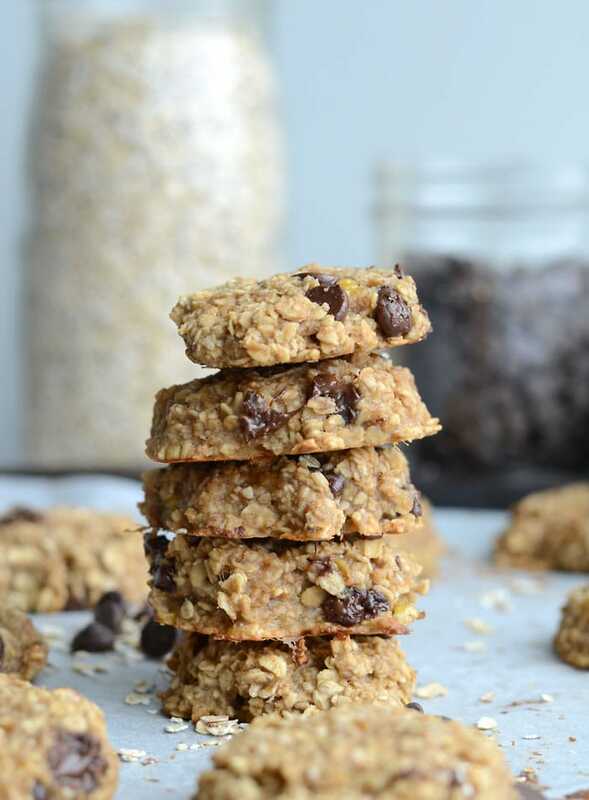 These flourless peanut butter banana oatmeal cookies require just 3 basic ingredients to make then you can have some fun with add-ins like chocolate chips! These cookies are a wholesome treat you can enjoy anytime of the day as a healthy way to satisfy your sweet tooth. Mash the bananas in in a bowl with a fork until they form a paste. Drop 16 spoonfuls onto a cookie sheet, shaping each spoonful into a cookie shape. Bake for 15 minutes. They should be firm and slightly browned when done. The maple syrup, vanilla, salt and chocolate chips are all optional. The most basic version of this recipe is just the oats, banana and peanut butter. Feel free to add in any or all of the options to suit your taste preference. Chopped nuts or raisins are also yummy additions! I also add 1 packet of stevia to make them just a bit sweeter. I’d totally eat these for breakfast! I added 1/8 tsp vanilla extract and 1/8 cup of ground flax. Also, I didn’t have chocolate chips on hand so I used 1 tsp cocoa powder and that did the trick. Thanks for posting! Great idea to add some cocoa. These sound like an awesome snack. Do they keep well in the freezer? I’d like to make a big batch and take a few with me on-the-go for busy days. I made a double batch of these! I had overripe cold bananas in the refrigerator, mashed them up. Added oats, cinnamon, regular salt, honey, and regular cheap peanut butter, because this is what I had. We also added dried cranberries instead of raisins, because we are sharing our cookies with our Maltese and our German shepherd! Although our dogs don’t eat grains in dog food, a little doesn’t bother them, and the peanut butter is high in protein, and the cinnamon is great for inflammation and blood sugar. Ok, we had to add a bit more oatmeal to make these hold up a bit better and after the first batch came out of the oven, we added an extra tsp of honey per batch to sweeten it up more. Note: ours didn’t spread out on sheet at all but rather stayed in the same little balls I put them in the oven! So, on the last batch we flattened the cookies out with our hands prior to putting them on the baking sheet. You don’t need to spray the cookie sheet. One of my cookie sheets was aluminum, and the other was nonstick. Didn’t make a difference. They are done when ever so slightly light brown as if you cook them longer they’ll be a bit dark on the bottom. Next time I will add crushed nuts and a few choc chips(not for dogs). Okay, the result: we liked them a lot for healthy cookies, and pretty much for a general cookie, though we liked the extra bit of sweetness. I’ll bet a bit of brown sugar would be awesome! The dogs are the surprising thing… We shared cookies with them, then bacon as well and I was really shocked when they gulped down the cookies a tad bit more than the bacon… Who knew? I will definitely make minor adjustments next time and do again really soon! Thanks so very much! FYI grapes and RAISINS are toxic to dogs!!! She said she used dried cranberries INSTEAD OF raisins. Very good, I added a little vanilla and cocoa and they turned out great. My husband liked them too, and he usually rejects healthy. I made these for my 5 and 8 year old kids with raisins and got two thumbs up. They liked them so much the next day I showed them how to bake them themselves, this time with chocolate chips, which they liked even better. Since the cookies are healthy, they also enjoyed getting to eat more than they otherwise would have. Now I’ll check back for some of your other recipes! These look so delicious! Definitely will have to try this recipe out! Thanks for sharing! exactly what i was looking for! thanks so much for posting! Yes, they will be as good without the vanilla. 🙂 Enjoy! I added coconut flakes and used cashew nut butter. Quick, delicious and nutritious. Have you or anyone else tried making these with old fashioned oats instead of quick oats? I want to make them now but never have quick oats at home! Either should work just fine. Enjoy! I have. They worked out great! This sounds so yummy! How do you think steel cut would work? I wouldn’t recommend using steel cut outs in these. Hope you enjoy if you try them! So I used steel cut, a little on the chewy side but still good. Next time I’ll refine them or used rolled oats. We added a small bit of blackberry fruit spread on some, yum! Thanks foe this recipe! I made these cookies and they were delicious! I added some toasted coconut and chocolate chips as well as vanilla. They are hearty, not too sweet, and perfect for a healthy snack. Thanks for the recipe! Love it. Those are the perfect additions!! So glad you enjoyed them. What a great idea! I’ll have to try that! Can we make it into bars?? Ya I think you could bake it in a square baking pan amd it should work out…haven’t tried though so I can’t guarantee it! Let me know if you try it. Made these today as a quick healthy snack on my gym/running day off and they were awesome! Very thick, I had to press mine down during baking as they didn’t spread at all. Dark chocolate & dried cranberries was an excellent mix with half a teaspoon of cinnamon. Thank you for this easy recipe! Yummm, love those additions!! Nope, with no oil or added sugar, these won’t spread at all so you need to make cookie shapes before baking 🙂 but sounds like you figured it out! How long can you keep this outside the fridge for? I think they’re fine at room temp for up to 4 or 5 days but I’d keep them in the fridge if possible. My 2 year old is allergic to dairy and egg and this sounds like an amazing addition to what she can eat. .
Oh, so happy she’ll be able to enjoy these cookies! Made these and we really like them. My kids are eating them up! I almost didn’t make these because I only had regular oats. I just chopped them up in the blender and went ahead with it. Glad I did. Don’t use Any syrup or any sweeteners. It tastes great without, and if ur like me sand hate chocolate chip, use nuts and craisins instead! Really good! Satisfied my craving for cookies. I used crunchy almond butter instead of peanut butter. I included the vanilla, Chocolate chips, and maple syrup from the optional add-in list. Yum, they sound awesome with crunchy almond butter! Glad you enjoyed. I feel like I have been searching for years for this perfect recipe. They are so easy, healthy and consistently delicious! Amazing, that’s some pretty great feedback!! Thanks! So happy you enjoy them. Made these with wholemeal oats and only used the three ingredients. I normally don’t even like banana when it’s cooked but these were surprisingly good! The pb I used only contains peanuts and a hint of salt but these were sweet, so no added sugar which I like????. Definitely making these again. Made this for the first time tonight! Such an easy prep & little wait time! Perfect for a healthy alternative to satisfy your cravings! Amazing, love this recipe ???? I’m so happy to hear that Mackenzie! I love this recipe too, so quick and easy and they always come out great. Thanks for the comment! Great recipe, thanks for sharing! I put old fashioned oats in blender and made a chunky oat flour, added a tablespoon of maple syrup, 1/2 tsp kosher salt, 1 tsp vanilla, chopped dark chocolate and chopped unsalted peanuts. Very good and slightly sweet! These taste even better refrigerated the next day. Next time I might add some vanilla protein powder and cinnamon. Awesome, they sound so good with your add-ins! I love them refrigerated too. So glad you liked the recipe! Thanks for the comment! Great recipe. I used PB2 peanut butter powder which cut a ton of calories and doesn’t compromise date. Next time I’ll add dried cranberries or nuts for some additional texture. Thank you for sharing!! You’re welcome. So glad you enjoyed them! I have a PB2 cookie recipe too, here: https://runningonrealfood.com/healthy-peanut-butter-oatmeal-cookies. But good to know this one worked with it as well. Thank you for the comment! This is my go to cookie recipe. It is so easy and delicious. My kids love them and I don’t feel guilty feeding them these for breakfast. This is a great recipe, so fast and easy to make. I’ve made these a few times now (without chocolate chips). My picky-eater 1 year old enjoys eating these with me for breakfast or snack. Thank you! That makes me so happy!! So glad you and your family have enjoyed them. Thanks for the comment! I made these cookies. They are very good. There are two instructions missing. Do I store the cookies in the refrigerator and how long should you keep the cookies? Hi Sandra, these can be stored at room temp for a few days, in the fridge for up to a week or frozen for up to 3 months. Enjoy. I found these to be very bland, despite all the additions as suggested. If I make these again, I’ll probably add some cinnamon or other spice to give them more flavor. How ripe and sweet your bananas are definitely makes a difference too. That being said, they are a 3-ingredient healthy cookie and we can only ask for so much from that 😉 so they might seem a little bland to some! Cinnamon is great though. Thanks for the feedback. You might like my 3-ingredient tahini date cookies better, they’re on the sweeter side with the dates in them: https://runningonrealfood.com/vegan-tahini-date-cookies/. 1/2 teaspoon is WAY too much salt. 1/8 makes more sense. I like salt, too. But 1/2 teaspoon ruined my batch. I tasted before cooking and had to double the other ingredients to effectively reduce the proportion of salt by 50% and it was still too salty. Thus, use 1/8 teaspoon or none at all. What kind of salt did you use? I find 1/2 tsp of a really nice quality sea salt is perfect for me. It is an optional ingredient though and to be added to taste. Thanks for the feedback, it’s helpful for others. Delicious. I’ve made these twice now and they are super tasty. Followed the instructions exactly and used chocolate chips the second time, which I would recommend. I found these worked best with overripe bananas. Mmmm, sounds so good! I wish I had some right now! So glad to hear you enjoyed the recipe! Thanks for the feedback. Can you please tell me if you can adapt this recipe using lfetover oatmeal that is already made? This recipe sounds great and I have a lot of leftover oatmeal that I would like to use in it, or in a simple, healthy recipe just like this. Thanks so much. Hi Anne…I answered your comment from last week but to reiterate… I think it would probably be okay but you may need to adjust the amounts used to account for the extra moisture from the cooked oats. I can’t say exactly how much of each to use but as long as you have a cookie dough-like consistency, I think the recipe would work. I haven’t tried it though! Let me know if you give it a try. My container of oats says 1/4c is 40 g. So 2c would be only 160g. I’ve already measured the 225g into my bowl so hope this is the correct measurement. If you followed my measurements, it will be correct. That seems to be a very low measurement for oats. Typically, for rolled oats, 1/2 cup is 50 grams and with quick oats it’s just a tad higher. I’ve made this recipe twice. The first time I added chopped peanut M&M’s, the second time I added 1/4 cup of cocoa powder. Yum! Instead of baking them, I made Tablespoon sized balls of dough, rolled them in crushed peanuts, then froze them. I loved these sweet frozen treats! Those. Sound. Ammmmazing. I wish I had some right now!! That’s the great think about these…you don’t even need to bake them! All the cookie dough balls!! Looking for something new to do with overripe banana. I threw in extras that were in my pantry. Dried cherries, chopped nuts, almond extract, and one packet of stevia. Great recipe that you can be creative with. These were excellent! Kids and I love them!!! Followed recipe, but used organic rolled oats and 1 tsp vanilla instead of just a half tsp… added the optional ingredients per recipe…. were delicious!!! Thankyou! Thanks for trying them and leaving a review! So glad you enjoyed them. These cookies taste great! This is my first time making healthy cookies as I am trying to reduce my sugar intake. I will certainly make them again. Thank you!! Very easy, simple and tasty. I’m not sure, Angie. I’ve never had an issue with this recipe. Did you follow it exactly as written? Sorry it didn’t work out for you! These are so good and my kids love them! I see 1 serving is 138 calories. What is the serving size? Hi Lorin – that’s for 1 cookie if you make 16 cookies out of the recipe. Glad you enjoy them! My cookies look exactly like your photo and are oh so good! I was shocked my kids helped eat every last one; I added mini chips and a bit of stevia and they were a perfect guilt-free snack. Thank you! So very glad to hear it! Glad the kids liked them too. Appreciate the review, thanks!! Delicious cookie that does wonders in ones mouth. Made these tonight with bits of dark chocolate on top. Pretty darn good, though a little dry. Next time I may experiment by adding a splash of milk or more peanut butter to the recipe. Great base though! Thanks!